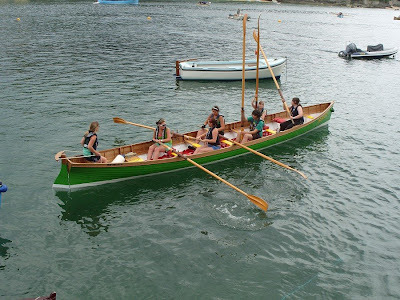 In the UK the Isles of Scilly are returning to normal after the 20th World Pilot Gig Championships. Nearly 120 teams took part in this year's event over the bank holiday weekend, making it the biggest event to date with the island's population soaring from 2,500 to 5,000. Weather conditions were perfect throughout the tournament with a challenging swell to test the teams' stamina and rowing skills. Among teams participating was Weymouth Rowing Club. The team recently became stars of the big screen in the film The Boat That Rocked. The film is based on the 1960s pirate station Radio Caroline, written and directed by Richard Curtis. Scenes were shot in Portland Harbour and Weymouth Bay and called for a flotilla of boats to gather around the Radio Caroline vessel. The Weymouth Club was approached because of their colourful gig Penny, brightly painted in green, yellow and red. Carol Craft, 24, a teaching assistant, said: "For the aerial shots, we had to spend nine hours on the water. Richard Curtis said he was amazed we were able to last that long and said we made him feel very humble. The fee we received has helped us pay towards another gig."